Generally I really hate to read someone's description of a great wine that they had with a meal, because without experiencing the wine yourself, the verbiage leaves a longing jealousy. It’s like, “I had it, you didn’t, nanna nanna na na.” Please bear with me, for I just have to tell you about today’s winegasm. I lunched today at my favorite restaurant, Marche Moderne, in Costa Mesa, California with a long time friend. I stopped at my wine locker on the way to the restaurant and grabbed a bottle, knowing that my friend was a serious Pinot lover and would appreciate a special wine. 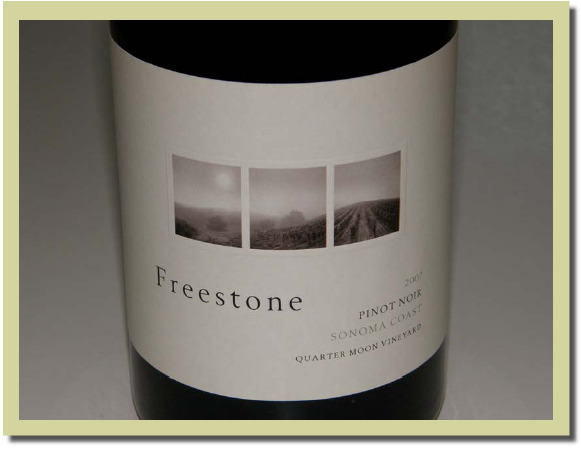 The wine I chose was the 2007 Freestone Quarter Moon Vineyard Sonoma Coast Pinot Noir (13.5% alc., 60 cases, $100). I first tasted this at the Freestone Winery in barrel in 2008 and again in bottle in 2009 and bought a few bottles. I loved it in barrel and really loved it in bottle early on. Quarter Moon Vineyard is one of Freestone’s Estate vineyards located on the western side of Bohemian Highway in the chilly, true Sonoma Coast about five miles from the Pacific Ocean. The vineyard lies above the fog line at 400 feet elevation and is in proximity to vineyards owned by Benziger and Kistler. Clones include heritage selections such as Calera and Dijon 115, 777 and 828. Sorting of the grapes for this wine was fanatically meticulous. 100% whole cluster fermented in a wood tank fermenter, the wine was aged in about 50% light to medium toasted new French oak, and bottled unfined and unfiltered. The winemakers were Theresa Heredia and Damien Parker. Today, after the wine was opened, my friend and I just looked at each other and smiled and as we finished the bottle over the course of an hour and a half, we kept remarking how stellar it was, certainly the equal of any great Burgundy we have had in recent years. This was the Holy Grail of Pinot Noir that so many devoted California vintners have searched for. It was perfect in every way. The aromatics were stunning with a bright perfume of cherries, rose petals and exotic Asian spice, the mouth feel was all velvet, the tannins were delicate, the red berry and cherry fruit was perfectly ripe and spiced, and the finish was fresh and clean showing a peacock tail of flavor of uncommon generosity. Seamless in every way and one of the greatest transcendent California Pinot Noirs I have ever tasted.